Ten titles, themes, etc., chosen at random, were examined, so as to show how contradictory and confusing they are, when we holistically look at them. Efforts were made to dissolve the contradictions and to get rid of the confusions by applying my one-dot theory and, for example, the crab and frog motion model. Once done, the same theory and a series of models were used to describe, explain, and infer or predict the contents of those ten publications, flyer/conference agenda, etc., logically, systematically, and coherently. Another way of saying the same thing is that what I have done is to convert and/or reinvent them, thereby offering an original, new perspective. Many crab and frog motion models were built, so as to enable me to slot in the information, (scientific and technical) data, and analysis of the contents in those writings. It is not impossible. 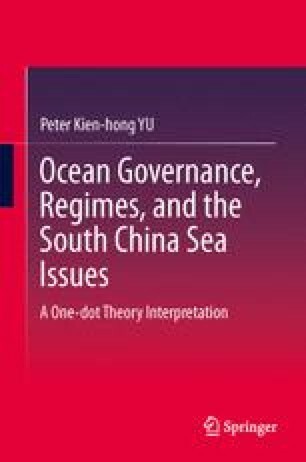 A sincere plea, therefore, is that we should consistently apply an appropriate theory and model to study ocean governance and along with it international regimes because we have to convince ourselves first before convincing others. It would not be an easy intellectual task, if done non-“dialectically.” Ask yourself: Can, for example, the game theory accomplish the same task?